Your boiler accounts for half of your annual energy use, so a boiler replacement with an efficient boiler could make a huge difference to how warm your home feels and keeping your energy bills low. According to the Energy Saving Trust a boiler replacement from an old gas boiler with no controls with an A-rated high-efficiency condensing boiler and full set of heating controls will significantly cut your home’s carbon dioxide emissions and could save you as much as £340 a year. 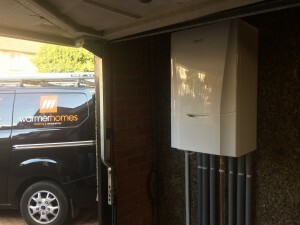 Warmer Homes Heating and Renewables works closely with homeowners and landlords to ensure we supply and install the best boiler for your home while keeping costs as low as possible. All of our new gas installations come as standard with 3 FREE years servicing worth £210 and either a 2 to 10-year product warranty depending on the make and manufacturer chosen (3 years free servicing not available with Government grant funded boiler installations). • Arrange a time that suits you to carry out a survey of your home and current heating set-up. • Provide you with a comprehensive and honest quote within 48 hours. • Explain the process of fitting your new boiler, answering all your questions and queries. • Install your boiler on a date that suits you. • Provide a full after-care service and written warranty.